Samsung PH announces it's latest multimedia smart tablet that offers HDR video support matched with Samsung's first ever quad stereo speakers brings your movies to real life. 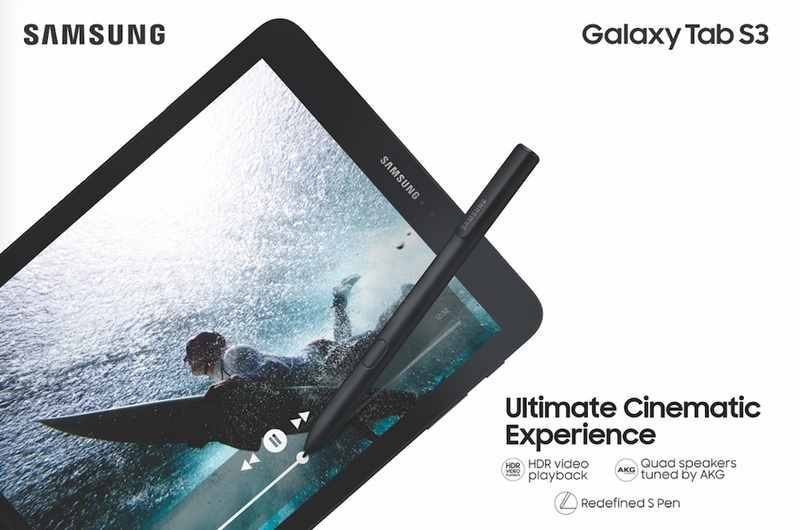 The ultimate cinematic experience is yours to enjoy as Samsung Electronics Philippines Corporation locally launches the new Samsung Galaxy Tab S3. The Samsung Galaxy Tab S3 provides the ultimate cinematic experience via best-in-class display technology. It has a 9.7 inch Super AMOLED display and is capable of supporting media in 10-bit colored High Dynamic Range, which gives you an immersive view of videos and images in stunning true-to-life colors. Adding up to the complete premium cinema experience is the clear audio provided by quad stereo speakers tuned by AKG by Harman. Now watching your favorite movies and TV shows will definitely be your go-to activity to de-stress after a long day at work. The Galaxy Tab S3 also has a nifty feature for gamers. It is equipped with the first-ever Game Launcher on a Samsung Tablet, which provides a personalized gaming experience, and Vulkan API support for superior graphics, something gamers would love to maximize for the perfect gaming experience. The Galaxy Tab S3 is designed for those who play hard and work hard. Ever versatile, it is engineered for maximized performance, boasting the best features in the form of Advanced AP performance and 4G RAM, which guarantee comfortable and efficient use of the device in every way. True to Samsung’s legacy of innovation, the Samsung Galaxy Tab S3 features a 13-megapixel rear camera, which includes auto-focus, and a 5-megapixel front camera to capture the most fun experiences in high-quality photos. The tablet also allows for storage expansion and supports Pogo keyboards, with no separate charging or pairing required. Designed to keep users always connected and minimizing down time, the Galaxy Tab S3 has longer battery life(6000 mAh) supporting up to 12 hours of video play back and built with Fast-Charging capabilities. On top of the packed line-up of features, the Galaxy Tab S3 comes with a Redefined S Pen. Thoughtfully designed for a more natural writing experience, the Redefined S Pen now has specialized tools and real pen features that enable users to efficiently create content. It also includes convenient features such as Screen Off Memo to quickly jot down notes, PDF Annotation for easy editing and, advanced drawing tools to create highly detailed illustrations. “The Galaxy Tab S3 is the gateway to the best of both worlds—superior mobile entertainment and enhanced productivity. It provides the ultimate experience gateway with the most vivid images, clearest sound, and efficient productivity tools for people constantly on the move.” says Ivan Pua, Product Marketing Head for IT and mobile, Samsung Electronics. “ With the Samsung Galaxy Tab S3, users are able to immerse themselves in their favorite media and fuel their passions to create content they can share with their friends and family”. The Samsung Galaxy Tab S3 is now available at Samsung Experience Stores and authorized dealers. It is priced at PHP 37,990 and comes in Black or Silver. Each purchase comes with a three-month unlimited iflix subscription so you can catch your favorite movies and TV series even on the go. Visit www.samsung.com/ph/tablets/galaxy-tab-s3/ for more information.